How to insert Descriptive Text into a Job. Symbols are standard “drawings’ which can be inserted into any CDS job. Any drawing that is stored in an Acad dwg file can be used as a symbol within CDS. 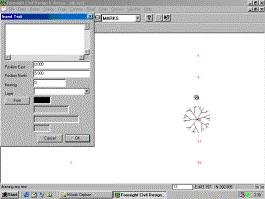 (Older versions before March 2005 used Windows Enhanced Metafile Format (EMF) and Windows Metafiles (*.wmf). Symbols can be created within CDS. Please see the tutorial appendix that gives an example. 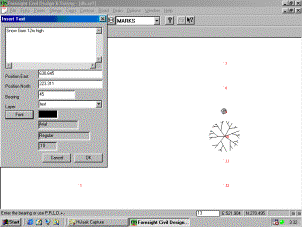 Also most Windows based CAD packages (e.g. Autocad, AutocadLT, QuickCad, TurboCAD) can store or export drawings to a dwg file. How do you Create a Symbol? Please view the tutorial appendix on Symbol Creation. Before you go any further, it is important that you comprehend a couple of simple facts about these symbols you are going to use. The Size of a Symbol. 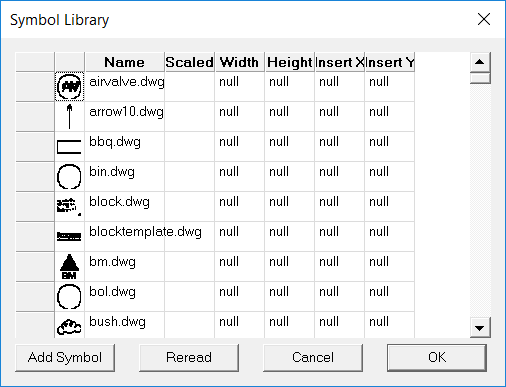 The symbol size is defined by how big the symbol is drawn in the dwg. For example if you have drawn a circle with a radius of 1 unit then it will be displayed at a size of meter if in metric mode. If you are displaying an Imperial job then the radius will be 1 foot. When inserting a symbol you have the option of applying a scaling factor. Inserting at a scale of 2.0 leads to a symbol twice the size. As well as determining the size of the symbol in real world dimensions, you also need to determine if a particular symbol will be scaled to match the drawing scale when the job is plotted out. Symbols can either be considered as representative or pictorial. For example, a drainage pit, would normally be representative i.e you would like them to be drawn at the correct scale on the plan to represent their true relative size on the ground. Alternatively, there are things such as light poles, or traffic lights or survey permanent marks which you may wish to represent with a symbol which is purely pictorial i.e. it represents the location and identity of the feature, but does not necessarily represent its true size in relation to other features on the plan. For example, the survey mark that we mentioned might be a nail in a kerb. If this nail was 10millimetres across the top, and you tried to represent it at the correct size on a 1:1000 drawing you would not see it, so it would be far more sensible to make its symbol non-scaleable so that it holds the same size regardless of the scale of the drawing. So, armed with these basic concepts it is time for you to try and apply them in a vaguely real situation, and to show you the procedure we will use some of the sample symbols supplied with CDS. We have provided a number of simple symbols with CDS to get you started, and we will concentrate on using just a few of these to show you the process of getting symbols into your CDS jobs and onto your plans, which is the ultimate aim of the exercise. Start CDS and use File Open to open up a job called sy1.cdsdat in your Tutor folder. Once the Job opens, maximise the screen. In this job you will see there are 12 points on the screen arranged in a rectangular fashion as seen in the screen at right. Pull down the Entry menu, select Symbols, followed by Symbol Library, and the screen will appear as at right. Here you will see all the symbols that are currently stored in the Variable folder displayed for you, and you may scroll down using the scroll bar on the right hand side to see all of them. If you look at the columns for a moment, you will see a graphic picture, the name of the symbol, a check box under the heading scaled. The Width and Height can be set to 0.0 and 0.0. The software will calculate the height from the dwg as you go. If the symbol is to be representational, and change scale with the scale of the drawing it is to be plotted on, then the “Scaled” box must remain checked. Logically then, if you want to represent a particular symbol as pictorial only you would uncheck the Scaled Box. The shift column is no longer used. The insertion point is taken at the 0.0,0.0 point from within CDS. If you scrolled down through the symbols, you would have seen that there were a number of TREE symbols, and we will first use a couple of these to demonstrate how the symbol can be inserted both manually, and automatically by means of the Code Library. First off we wish to insert a symbol called TREE1. Pull down the Entry menu, highlight Symbols, and select Insert a Symbol and the screen will appear as seen below. 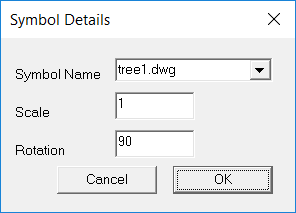 You can use the pull down option and scroll down through he symbol names, or you can type in TREE1.DWG or simply TREE1 in the field. Once you have TREE1 in the field select the OK button and you will see the pop up screen disappear, and a square will appear attached to your cursor. Move your cursor and you will see the square will follow you, and you should position the tip of the cursor over point 9 as seen in the screen at right. Once you have positioned it correctly, simply press the left button on your mouse, and the square will be placed centrally over Point 9. Now, at this stage you are probably thinking that you have been robbed, since the square is hardly a tree symbol. Don’t be concerned. For reasons of speed, only the surrounding rectangle is shown when you are placing the symbol. If you redraw the screen by pressing the “D’” key, the symbol should appear. If it does not, you need to make sure symbols are turned On using the Modes screen. When the screen reappears, you will see the rough outline of a tree appears in place of the square, and you may zoom in to get a closer look if you wish. OK, you have a symbol in place, but because you didn’t do anything about the scaling when you inserted it, your tree will appear with a canopy of 1 metre across, which means it is probably closer to a shrub rather than a tree. 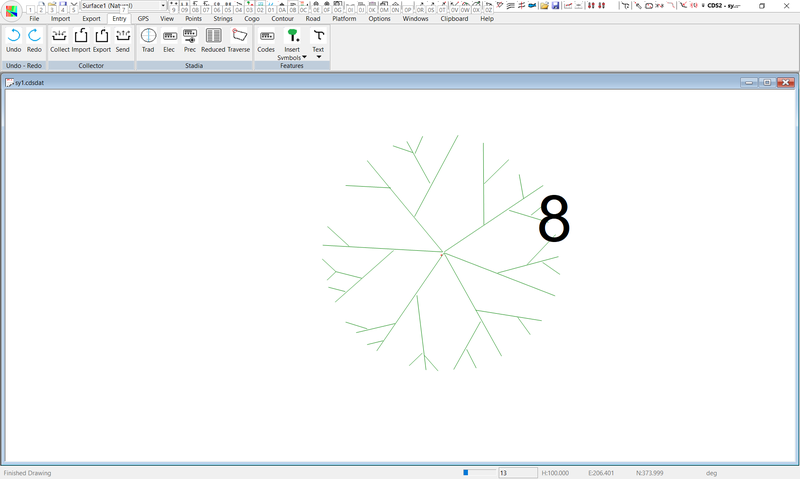 Lets now insert the same symbol over Point 10, but this time our field party has told us that the canopy of the tree has a spread of 5 metres. Pull down Entry again, highlight Symbols and Select Insert a Symbol. Enter TREE1 as the symbol to insert, and this time enter a scale of 5. You will see a bigger box (5 times bigger in fact) than you saw last time, and you should insert it on Point 10. Again the square will be shown, but when you next redraw the screen you will find the screen at right, with a tree with spread of 1 metre over point 9 and a tree with spread of 5 metres over point 10. Now, if you look closely at Point 10 (maybe even zoom a window around it if you like), you will see that the dot representing the point, and the dot marking the centre of the tree do not coincide. This is because we simply positioned the cursor “roughly” near the point, and in some cases this is more than good enough. However, in other cases you require the symbol to be locked onto the point precisely, and you can achieve this as follows. Display to see a screen like that below. If you look down the column headed “Point” you will find that both symbols show –1. This indicates that the symbol has been placed “in space” rather than exactly over a point in the database. If you look to the columns to the left you will see the coordinates that have been used to located the point when you positioned it on the screen. You can use this capability to position all manner of descriptive information that is not related to any particular point on your job. For example a North Point can be located wherever you like, as can your Company Logo if you have it in dwg format. When you wish to position a symbol exactly over a point, you simply type the point number required into the Point Column, as seen at right. (You will see later in this Tutorial that you can also use Feature Codes to position symbols over points) NOTE: you may, if you wish, come directly to this table and simply type in the name of the symbol, the size and the point to locate it over if you wish to manually position symbols over existing database points. You can also use this table to alter the sizing of a symbol you have already placed. In the event that you wish to delete a symbol that you have placed, you also come directly to this option. Use your cursor to select the Line Number of the symbol you wish to delete. I.e. click on the line number on the left-hand side. You will see the entire line is highlighted or selected, and you can then simply press the Delete key to remove the particular symbol. Be careful, since there is no undo facility available. Next it is time to learn how to use feature codes to insert symbols automatically. Insert a Symbol using the Code Library. As well as inserting individual symbols as we have already done, you can ‘automate’ the process by using codes and the code library if you wish. To do this, it is necessary for the points to be coded with ‘feature codes’ and for you to set up a code library defining what you wish to do with those codes. 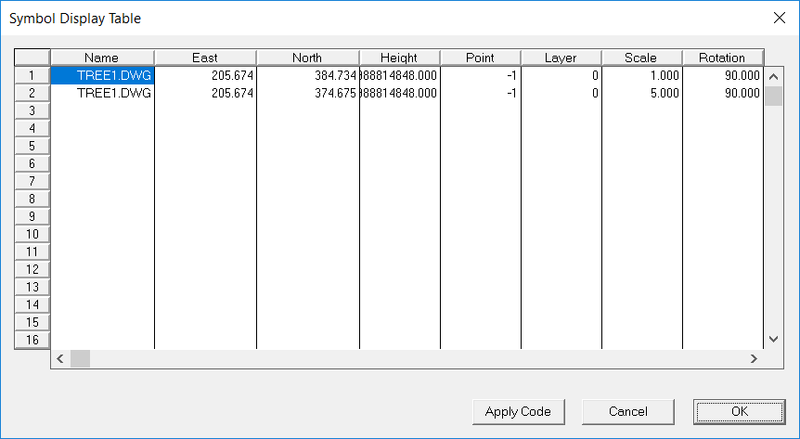 In Job SY1, we have already supplied codes for points 3 and 5, and you can check on these codes by either using Modes - Display to turn them on, or by using the “?” key to query the points. (You should find that Point 3 has a code of PP to indicate a power pole, and Point 5 has a code of STN to indicate a Station.) So, we have complied with the first of the requirements in that we have some points with codes. Now we need to set up a code library. Pull down the Entry Menu, and select Feature Codes. We wish to create a new library, and we will give it a name of SYMBOLS, so type that into the field titled ‘Library Name’, and then press the TAB key to move on to the next field which is titled Tag Character. 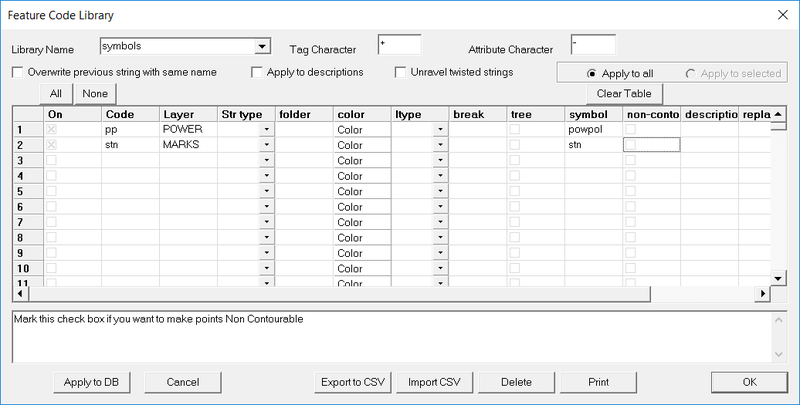 This is the character that you will use to indicate that you wish to ‘Tag” codes together, and though it is not applicable in this example, you should enter in the “+” key, and then press the Tab key to move to the field titled ‘Attribute Character’. Here enter the ‘-‘ character, since later in this example we will wish to apply attributes to the symbols we are using. The cursor will now be in the Column titled Code on the first line, waiting for you to type in the feature code you have used, and then to indicate what you want done with it. Our first code is PP, so type it in and press the Tab key to move into the ‘Type’ column. Here you will see a drop down list showing you the various types of codes available. For this exercise, we are only interested in codes which apply to particular points, so you should select the ‘Point’ type either with the mouse, or by typing ‘P’ followed by Enter. The cursor will now be in the ‘Action’ column. The action you require is to place a symbol over the point, and you have a symbol called ‘powpol’ in your symbol library which you wish to use to indicate power poles. Type in ‘S=POWPOL’ to indicate that wherever the program finds a point with a code of PP it is to insert the symbol ‘powpol’. Then press enter or Tab to move the cursor into the layer column. Type in ‘Power’ to indicate that all points with this particular code are to be assigned to a layer called power. The cursor will move to the Folder column, but since we are not interested in strings in this example we have no need for a string folder, so simply press Tab to move past it and leave it blank. The cursor should now be in the Code column again, so type in “STN”, set it as a Point code, define the action of ‘S=STN’ and assign a layer of ‘MARKS’. Again Tab past the Folder column to finish off the line. Your screen should now appear as below. At this point you are ready to now apply the codes to the points in the database, so select the ‘Apply to DB’ button. A prompt will appear to inform you that the library has been applied, so click on OK to confirm the message and proceed. Then select the OK option to save the code library details and close down the window. 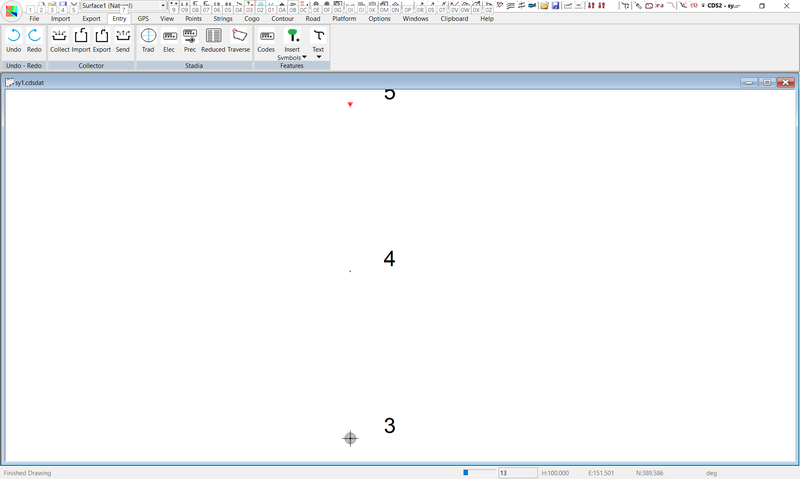 You screen will appear unchanged at this time, but if you reDraw by pressing the ‘D’ key and then Zoom a window around points 3 and 5 you should see a screen similar to that at right. Here you will see that symbols have been inserted over points 3 and 5. But, before you get carried away with the excitement of this discovery, you need to consider the size of these symbols. You will see that they are both approximately the same size as the tree which is over point 9, which we have already determined is 1 metre across. Since most power poles are only about 300 to 400 millimetres in diameter, we obviously need to make an alteration here. Also, most Survey Stations are marked with a peg or monument which is considerably smaller than 1 metre square, so we need to take remedial action here as well. You already know from your tree exploits that you can change the size of a symbol within the symbol library itself, and now you will see another method for achieving the same result. In this instance, power poles can be of differing sizes, so we don’t wish to use the symbol library to reduce our symbol to a uniform size. Instead, you need to size the symbols as they are inserted and you can achieve this as follows. Pull down the Entry menu and Select Feature Codes. Use the pull down arrow and select a Library name of SYMBOLS, and you should see your code library again. Move the cursor into the Action column on the first line, and position the cursor at the end of the entry. What you wish to achieve here is to have a power pole drawn with a diameter of 300 mm. To achieve this, you need to Magnify or Multiply the base scale of 1 metre by a factor of 0.3. So, after the word ‘powpol’ you place the ‘-‘ sign to indicate to the program that attributes are following. Next select the “Apply to DB” option. 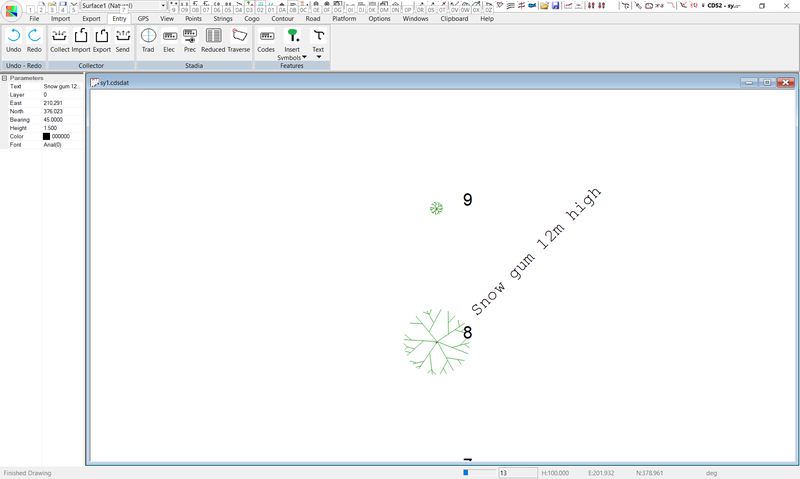 When you redraw your screen with any of the zoom or pan functions, you will see that the symbol representing the power Pole has now been reduced in size so that it appears correct in relationship to the tree over Point 9 that you compared it to before. If you recall the basic concepts at the start of this tutorial, you will remember that we said that a pictorial symbol is one which is inserted at a particular size which is generally not representative of its size on the ground, and that it is generally not scaled up and down with the scale of the final plot. The symbol signifying the Station which is inserted over Point 5 is a case in point. Here the Station is in fact a Peg which is 50 millimetres square, but if we tried to draw the symbol to that particular size we would have difficulty finding it. The size you choose will depend largely on the scale of the drawings you are going to produce, and to your particular aesthetic values, so please treat the number used below as a guide only, and use your own values as you see fit. You also wish to indicate that this symbol is NOT to be scaled with the plan scale, but will be drawn at 4 millimetres regardless of the scale of the plan. To achieve this, pull down the Entry Menu, select the Symbols option and then select the Symbol Library option. Scroll down until you find the “STN” symbol. First, ‘uncheck’ the scale box to indicate that it is to stay the same size regardless. Then enter a “Size” of 4. Why 4 I hear you ask? Because, you set the symbol up as if it were going to be plotted on a 1:1000 plan. If that were the case, and you left it at 1, the square with 1 metre sides holding your symbol would be plotted on the paper with sides of 1 millimetre, whereas you want them to be 4 millimetres. If you need to insert Descriptive text into the job for things such as Road Names or construction notes or Tree descriptions, you can do so in the following manner. Pull down the Entry menu, select Text, and then select Insert Text. The screen will appear as at right. You will see a window pop up, and you can “Drag” it around the screen so it is clear of where you want the text to be. You can type in whatever text you wish to add in the ‘window’ at the top of the pop-up. Here we wish to type in a description of “Snow Gum 12 m high” to the right of the tree over point 10. So first type the string of text into the text window. You can now choose where to locate this text, and you may either Point with your cursor to indicate where it is to start, or, if you wish you can type in the coordinates of the start point you require. In most cases pointing will be simpler, so move your cursor to a location at the right of the tree. Pick the point with your left mouse button, and you will see the coordinates appear in the Text entry box. Next you need to enter in the bearing for the text. You may either type in a bearing in the usual format, or you can use the “P” option to get the bearing between two points, or you can use the ‘D’ option to draw the bearing you require on the screen In this case, we will use a bearing of 45, so type that in. Next you need to set the font and size for the characters, so pick the ‘button’ labelled ‘Font’. You will see the familiar windows font selection panel appear to allow you to choose what you require. As an example, pick Arial, 10 Point Regular and then select OK.
You will see these values now appear in your pop-up text window similar to what you can see in the screen at right. Once you are happy, press the OK button and the pop up screen will disappear. Now, before you panic because you can’t see the words let me assure you that the text will appear the next time you redraw the screen. If you don’t wish to take my word for it, press the ‘D’ key to reDraw, and you should now see the words, as seen at above. Armed with this knowledge, you can now insert all manner of text onto your drawings, but I do advise that if you wish to get into serious schedules, and tables of text and the like you are much better advised to do it in your CAD package.